Very cute Christmas sweater by Victoria Jones. 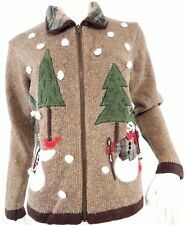 This is a button front sweater with great Christmas patchwork designs. 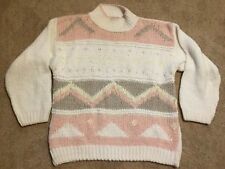 This sweater is in great condition. 45% Cotton exclusive of decoration. Remove promptly. Material : 70% Lambswool 20% Angora 10% Nylon. Pearl Button Front. Color : Black. Lining Material : N/A. Sleeve Length : 20.5. Victoria Jones Petite brown Christmas sweater. Hand wash cold, lay flat to dry. Plaid collar with dark brown trim. Brown ribbed trim around bottom and cuffs. In very clean pre-owned condition. Bottom - 19" across. Embroidered, Embellished and Beaded. 22" Length. Covered Buttons. 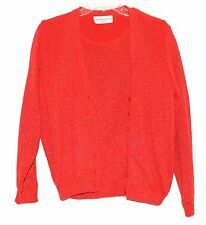 Red Embellished Sno wman Beaded Designer Originals Bling Cardigan. This sweater has 3/4 sleeves and is long in the body. Scattered throughout the embroidered design are various sizes & shapes of beads, and colored stones. This item is in very good USED condition. 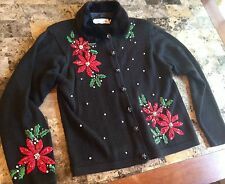 Very beautiful ugly Christmas sweater. Removable "fur" collar. 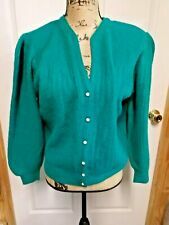 The cardigan sweater buttons up the front and the short sleeve sweater is a pull over for closure. Both the sweaters are in excellent condition. Shoulder to Shoulder on Cardigan: 15 1/2". Chest/Bust on Cardigan: 40". 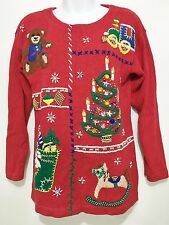 You are looking at a Women's Ugly Christmas Sweater/Holiday Sweater. The brand is Victoria JOnes, the size is a petite medium, but seems more like a petite small. It buttons up the middle. It is in used, but good condition with no stains or rips. Get your holiday spirit on!! POINSETTIA GREAT DETAILS WITH BEADING. VICTORIA JONES UGLY CHRISTMAS SWEATER VEST. BLACK RED GREEN GOLD MULTI. HAND WASH COLD. LONGER IN FRONT. Black with gold beads. Length from neck to hem 23". Hand wash cold water. Lay flat to dry. Length of back=23". Length of sleeve from shouldr seam=21". All proceeds from this sale will benefit the dogs and cats at. There is a snag on the front of the shirt and a stain on the back. Armpit to armpit is approximately 23 inches. Total length is approximately 24.5 inches. Please look closely at all photos. Feel free to ask any questions you may have. Great for an extra layer, and pretty too! I will decline them. length: 21 3/4in. Made by Victoria Jones Petites. 55% Ramie, 45% cotton. Off white color with gold & silver beads, pearls, sequins. Enhanced with embroidery. No holes or stains. I think that it has an elegant look. Ugly Sweater Vest. Buttons up the front with covered buttons. Great used condition. Armpit to Armpit - 18". Light Shoulder pads.